Summer movies are supposed to be fun; that’s kind of the point. Ever since the Christopher Nolan Batman films, however, summer movies have gotten into a tendency to be a bit moody. We saw it in subsequent Marvel films like Iron Man 3 and more disastrously, in DC’s Man of Steel. Or worse, summer movies are big, loud, and just plain stupid; we probably have Michael Bay and the Transformers films to thank for that, but the studios and film-going audience are a bit complicit it that. When a movie comes along and manages to deliver a solid film while also providing a good time in the process, it makes something special; such is the case with Guardians of the Galaxy. Based on the lesser-known Marvel comic, Guardians of the Galaxy is equal parts The Fifth Element, Firefly/Serenity, and the original Star Wars trilogy all rolled into one. If you have yet to see the biggest movie of the year, it follows Peter Quill (Chris Pratt) aka Star Lord as he gets himself into some intergalactic drama over an orb he tracks down and tries to sell. He gets the attention of Ronan the Accuser, who plans to deliver the orb to Thanos, who will help Ronan seek revenge on the planet of Xandar, which he holds responsible for the destruction of his people. 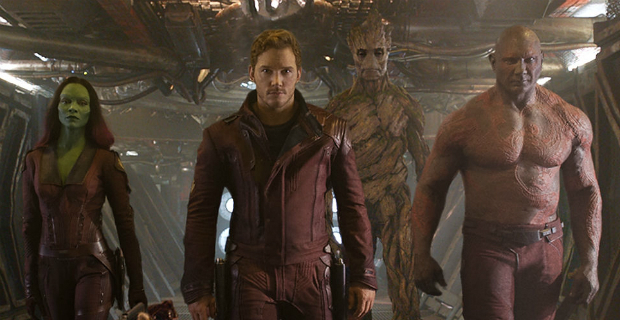 Along the way, Quill is joined by Gamora (Zoe Saldana), a former lackey of Ronan looking to sell the orb for herself, Rocket and Groot, a team of bounty hunters who just so happen to be a raccoon and tree, respectively, and Drax, a beast of a man looking to exact his own revenge on Ronan. This galactic, smaller version of The Dirty Dozen is full of their own individual drama, but Guardians of the Galaxy doesn’t suffer from trying to emulate The Dark Knight. In fact, Guardians is easily the most fun you’ll have at the theater this year, and a lot of that has to do with Chris Pratt. 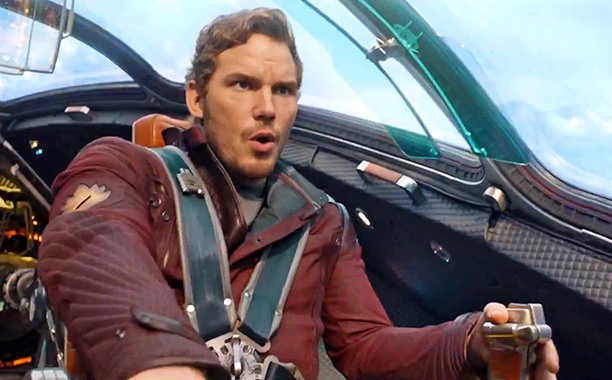 In recent years, Pratt has become well known as lovable goof Andy Dwyer from Parks and Recreation, but here, he flashes the cocky charisma similar to Harrison Ford in Star Wars, only maybe with a little more fun. He perfectly makes the leap from TV ensemble to big budget leading man. This movie plays both on his comedic chops and his on-screen charm. The rest of the Guardians turn in fine performances, most notably WWE standout Dave Bautista. Maybe it’s just the mere fact that he only had to reach a low bar of expectation, but he put a lot into his role as Drax and he doesn’t a wonderful job. I can’t forget about Vin Diesel’s turn as Groot, who is able to emote so much out of just three words. Saldana and Bradley Cooper as Rocket round out the team of misfits with pitch-perfect casting. The worlds James Gunn and his team manage to create are fully realized and each unique in their own right. From the gritty space prison to the lush cityscape of Xandar, the backdrops are about as vivid as what we saw in the Star Wars prequels, which may be the only positive I’ll ever say about those movies. The film feels like a universe in and of itself and it’s pretty impressive, even in simple 2D. I can’t finish this review without mentioning the soundtrack. “Hooked on a Feeling” gets plenty of play on the trailer, but it’s just the tip of the iceberg for one of the most toe-tapping playlists any movie has put together. “Come and Get Your Love” by Redbone, The Pina Colada Song, “Ain’t No Mountain High Enough”, and the Jackson 5’s “I Want You Back” are just some of the songs you’ll hear during the film. And yes, they even managed to squeeze in some Ziggy Stardust with “Moonage Daydream”. It all creates a throwback feeling that makes Guardians of the Galaxy one of the most unique and fun experiences you’ll have at the movies this year.